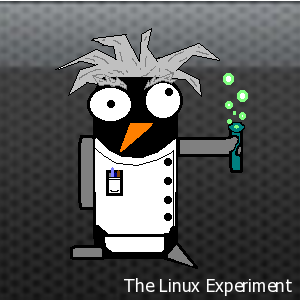 While I haven’t quite figured out what I’m going to be doing for this round of The Linux Experiment, I have decided that now is a good time to try something I’ve been meaning to try for a while: get Linux to boot off of an external hard drive. This was actually such a straight forward process, simply install like normal but choose the external drive for the location of all files, that I won’t bother you with the details. The only special thing I did was decide to install GRUB on the external drive making the whole install essentially a completely isolated thing – that way if I turn off the external drive then the computer boots up off of the internal drive like normal, if I boot with the external drive on then GRUB asks me what to do. The only downside to a setup like this is that I am using USB 2.0 as my connection to the hard drive which means the disk I/O and throughput will be theoretically lower than normal. Arguably I could get around this by using something like USB 3.0 or eSATA but so far in my experience this hasn’t really been an issue. Besides once the OS boots up almost everything is running and/or cached within RAM anyway. In fact that only problems I have run into with running Linux on this desktop were, ironically, driver issues. First up is the wireless drivers. Yes, it is 2013 and I am still having Linux WiFi driver issues… This issue was unlike any I had seen before – the wireless card was automatically detected, the Broadcom proprietary driver was automatically selected and enabled, it even appeared to work but no matter what I tried it simply would not make a lasting connection to the wireless network. On a whim I decided to just turn off the device driver and, even though the dialog window told me that I would no longer be using the device, things suddenly started working like magic. I have to assume that buried deep within the Linux kernel is already an open source implementation for my wireless driver and that is what is actually working right now. Whatever the actual cause, the device is now working flawlessly. 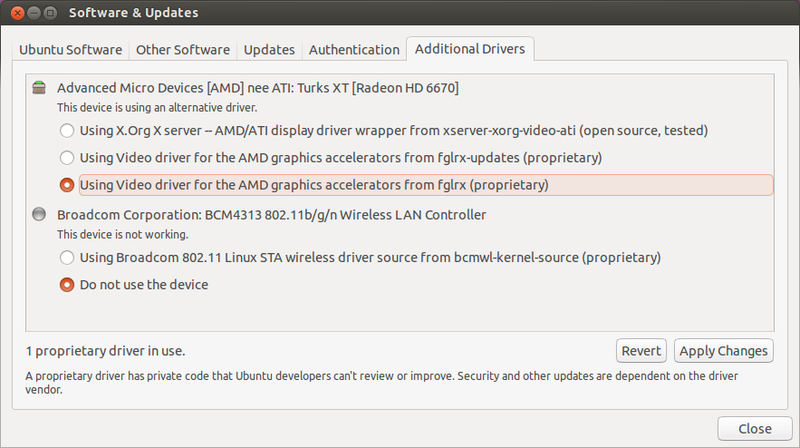 The other driver issue I had was again related to a proprietary driver, this time for my graphics card. By default the install used the open source driver and this worked fine. 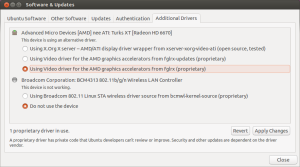 However I have had a long battle with AMD/ATI cards working on Linux without using the proprietary driver and so I decided to enable it in order to avoid any future problems. One reboot later and not only was my colour and resolution completed screwed up but I also got this “awesome” overlay on my desktop that said “Hardware not supported”. I tried to take a screenshot of it but apparently it is drawn onto the screen post-display or something (the screenshot did not show the overlay). So for now I am back to using strictly open source drivers for everything and amazingly it is all just working. That’s probably the first time I’ve ever been able to say that about Linux before.